Seen a couple of users asking about this and I thought I did a guide for it but turns out I haven't actually put it on here yet. Frozen Marathon can be completed without instant refills! As you can see I have the avatar and I have NEVER used an instant refill. Some of these items are requested by the Snowman which will require needing to come back and re-freeze things. If however you don't do those quests and you want to get the "Spend 2,500,000 IcePoints" asap, then yeah use the refills. You'll also need to come back later to create 5 of each cube for some other avatar (one that I am still working on). First you need to workout your timezone against the time on IcePets. New York Time The 24 hours window you have to complete this isn't set between 00:00 and 00:00 IcePets time, you can start it anytime you want. When IcePets reaches 00:00 midnight, the waiting time to create another ice cube resets back to 59s, so you want to sort of aim to do roughly 30 cubes before IcePets midnight and the other 30 afterwards. You want to collect together 60 items for this run, it took me about a year to get everything together because a lot of them were obtainable for free for selected events. Why spend hundreds or thousands of icepoints when you can just wait a few weeks/months and get them for free? There is a guide available here that lists everything that can be frozen. I wasn't on here during April 2015 when the egg hunt would have been going on but I was on April 2014 and all of the eggs at the time (before the new ones were made) you could get during the event. If this is incorrect could someone please tell me! Each of these can be collected from the Dabu once an hour. You can get these items from the Token Booth once you have the correct tokens required for them. To my knowledge, items #12 through #41 are available from the Easter Event. The Birthday Cake can be obtained from gifting a user on their IcePets Anniversary. So you can get a freebie from #42 and use it to get #43. During previous years the Christmas Snow Jar has been available through the Advent Calendar on the 25th Day. #45 to #60 can be found at this store. The Ancient Snow Jar and the Flying Snow Jar can be purchased from the Plot Store after you have completed it. There are other Snow Jars available for 15,000 iP as well. I just picked the first two I could think of. Now that you have your items is time to prepare for the run! Grab your Mountain Dew (or other high energy drink) and some snacks and we're ready to go! Select your first item, pay 1,000 iP. 59 seconds will then begin to countdown. Can sit and watch this. After that, it will let you put another one in. 120 seconds will then start counting down. So each cube is then adding another minute on top of the waiting time before you can do the next one. The first few you can hang around the Ice Box tab, they won't take long. Eventually though we're going to end up in hour long waits until we can do a new one. So this is where the alarm clock/countdown timer will come in. First 10min or so, yeah you'll likely be around the tab anyway but later on you might want to go and fiddle with something else such as making some food. When I did it, I would put in the timer a few seconds short, just enough for me to get back to the tab in time to watch it refresh and then quickly select the next item to be iced. 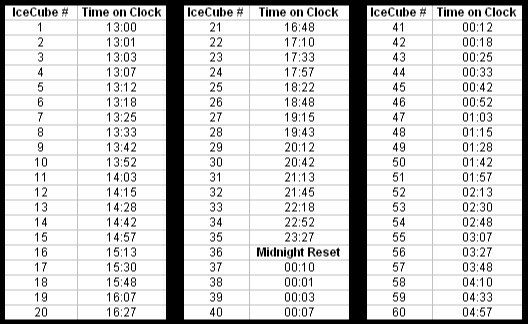 I've only done it up to cube 40, because around this time you should be crossing the 00:00 midnight reset and returning back to 59seconds, 120seconds, etc etc. 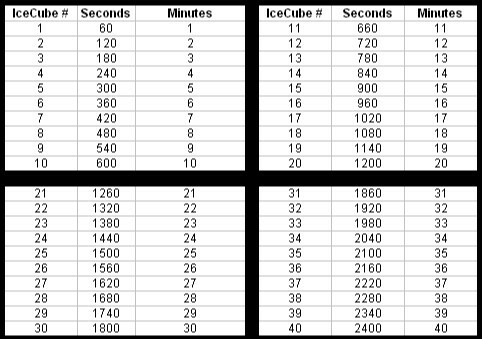 So here is an example beginning at 13:00 (1pm) IcePets time and ending at 5am IcePets time. This is when I did it, and you want to look at doing a similar run to these times. This is an awesome guide @SpunkiSpirou !! I'm going to attempt it in the next few days so I'm so glad to see your guide on the times! Also a fun fact is you can get rare snow jars from the scratchcards. That way they are only 1000ip. I received the Tech Snow Jar and the Crystal Snow Jar. And if you want to spend real money, you can get the treasure chests for buying IC at the ICE shop for free and you can freeze that. Wish me luck on the marathon! That's a tough one, @Arkyfire! Good luck! When I wrote this guide I wrote it to be as cheap as possible, so yeah some users will use the instant refills and won't care about costs cause their aiming for set avatars. But others, like mysen, might be trying to save iP for other things so want to use as less iP as possible. So with the scratchcards yeah they cost 1,000 iP per scratch but its not guaranteed you will get a snow jar from those. How much did you have to spend before getting those snow jars? A crystal snow jar is 15,000 iP in the snow jar shop (if I remember rightly) so you know if you get it there you'll only spend 15,000 iP for it. But the scratchcard, yeah you could spend 1,000 iP and get one on the first scratch, hooray you saved yoursen 14,000 iP but you could be unlucky and spend 15,000 iP and not get any, you see what I mean? This is the same with the treasure chest item, some users may be unable to pay real money on the site so this item will be harder for them to get in order to freeze it. The chefs hat I did mean to put on here, I will go back at some point and edit it in as a #44a or something in the middle of the snow jars. You know after the 1,000 iP snow jars but before the 8,000 iP ones. At the time of doing this board though it was like I'd been writing it for around 5 hours and I just wanted to get the last little bit finished up asap so I could go do something else. Using this as we speak! Thanks for being awesome and putting this together. This is insanely awesome and i will be using it. Ice cubes give me a headache along with their avatars!